I would like to cordially invite you to this year’s performance about the Universal Declaration of Human Rights, put on by the junior elective class in the Future Academy. 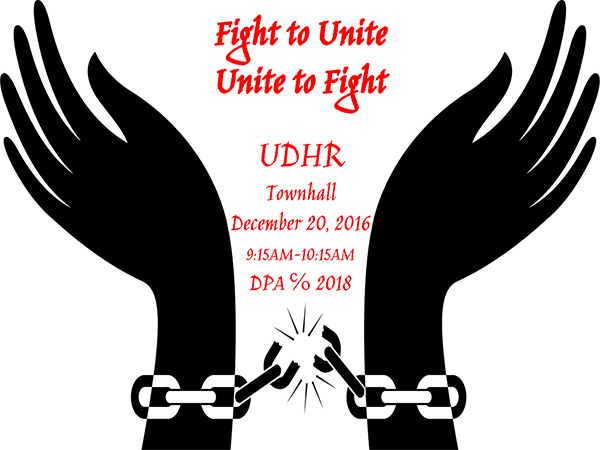 This year’s theme is “Fight to Unite, Unite to Fight.” The show will be a collection of performances, including poetry, music and skits, created and performed by our juniors, about human rights and current issues of justice and equality. The show will be held on Tuesday, December 20 at 9:15 in the Arroyo cafeteria. Please see the attached flyer.